NOD-E is a minimalist Reaktor-based and ABreakpoint (Lemur) inspired instrument that offers a wide range of possibilities for melody composition and/or sample triggering both software and hardware, using a clear and user friendly interface. Like ABreakpoint, it is aimed at sound design, allowing the use of MIDI-learn in all its controls in order to modify their behavior in real time via MIDI by any external controller. 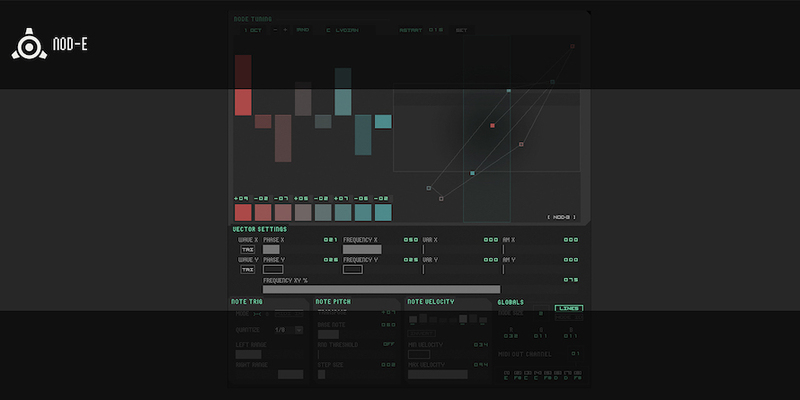 Latest version of Native Instrument Reaktor for PC or MAC. Reaktor Player is NOT supported. The package size for this download approx. 1MB zipped, so please allow yourself ample time to download the file if you are on a slow internet connection. On a fast connection, you should be able to download the package in about 15 seconds, while on a slower connection it may take up to an minute or so. If you have any issues, please feel free to contact us 24/7 for help. Please consider using Firefox and the free download extension, Down Them All, if you are having problems with your downloads timing out. Get it at the Down Them All website. Antonio Blanca, known for his world class Lemur templates, Reaktor ensembles and sound design, is the latest member of the Twisted Tools team so expect more from him in the future!